I made my first Dorie Greenspan recipe this week. That’s not a big deal for some people, but it is for me. Fancy French food intimidates me, and I think of Dorie as one of those great French cooks. She writes cookbooks, for God’s sake. Fancy, wonderful, gorgeous cookbooks. Don’t get me wrong – I love eating French food. It’s the making/baking part that freaks me out. Here’s what I learned from Dorie this week: fabulous doesn’t have to mean fussy. This recipe was beyond fabulous, and it could not have been easier. 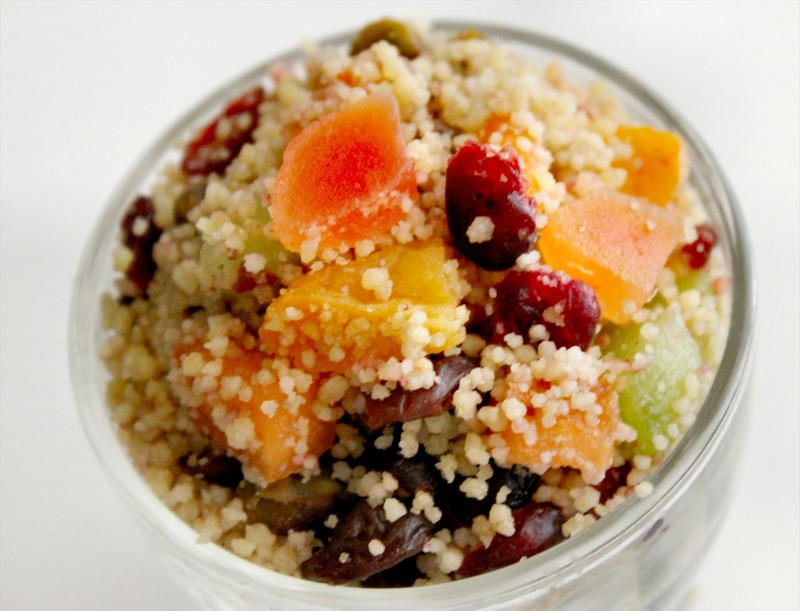 All you need is a handful of ingredients and a few pieces of the right equipment. 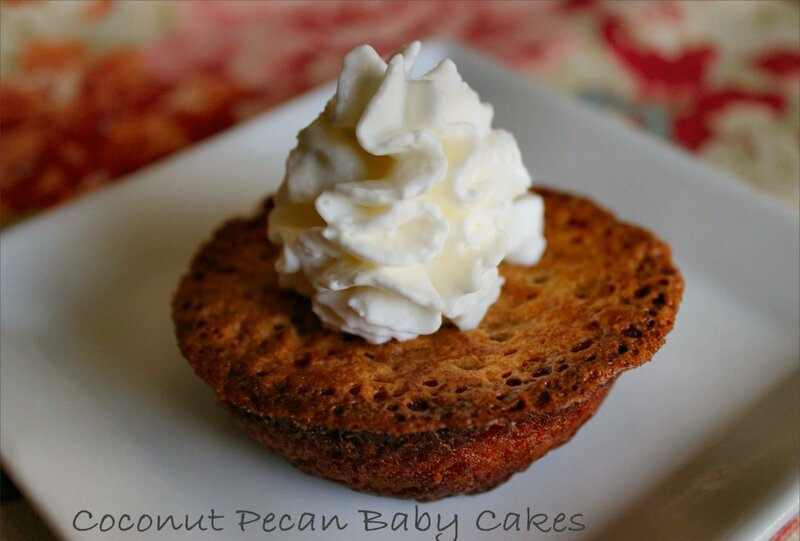 On Dorie’s blog this week, she posted a recipe for Almond Baby Cakes. I was intrigued. As I read it, I was amazed that so few ingredients were required. Then I got to the part where she said, “If you play around with the recipe, let me know what you do … please.” Those of you who know me know it takes very little to get me to play with my food. I have a hard enough time sticking to recipes; I’m a recipe fiddler. But when you INVITE me to mess with a recipe, well I just can’t say no. There’s something wrong with my wiring when it comes to stuff like that. So here’s what I did to Dorie’s Baby Cakes. Instead of almonds, I chose pecans. And since I love coconut, I decided to throw some of that in there, too. Coconut and pecans go together like peas and carrots. Chocolate and peanut butter. Biscuits and gravy. And since the recipe called for a little rum, I grabbed my bottle of Parrot Bay Coconut Rum. Laugh all you want, but God help me if coconut rum & Coke over ice isn’t a little piece of paradise on a hot summer day. So armed with my collection of substitutions and one secret ingredient, here’s how my version of Dorie’s Baby Cakes went down. To start, make sure you place an oven rack in the center rung of your oven and pre-heat it to 350F. 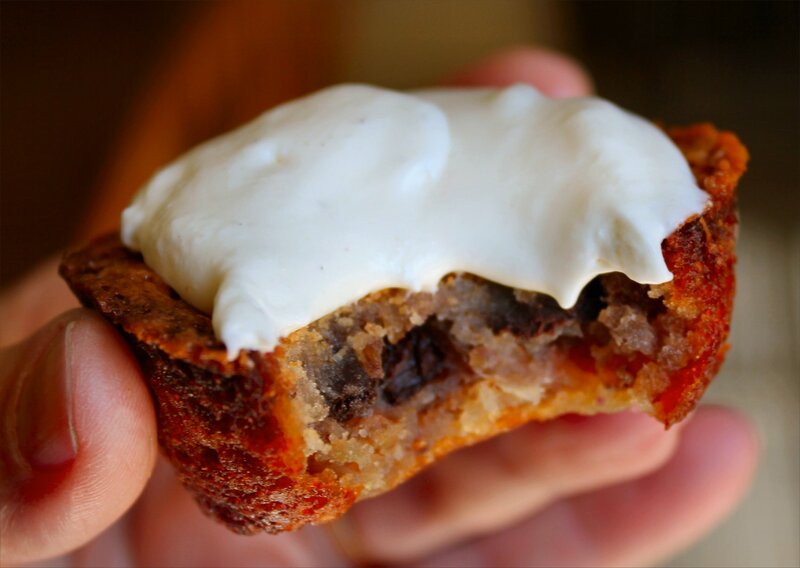 Using a standard 12-count muffin pan, butter each cup of the muffin tin generously. 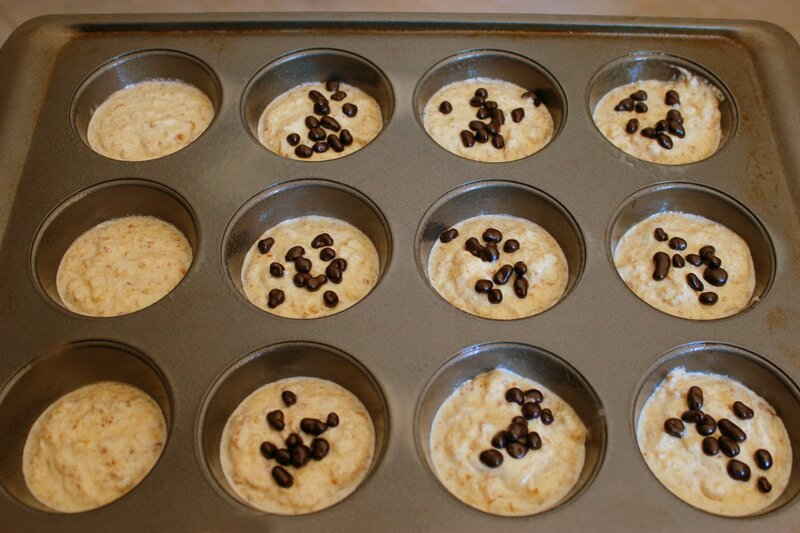 Using parchment or waxed paper, cut a small circular piece of paper to fit the bottom of each muffin cup. (Hint: I used a small-mouth canning jar lid ring as my pattern.) Place the paper in the bottom of each cup, then generously butter the paper as well. In a shallow baking pan, I toasted my pecans and coconut for approximately 10 minutes, or until I could smell their lovely fragrance coming from my oven. Dumping them into the food processor with 2 tablespoons of the sugar, I pulsed the pecans and coconut until they were coarsely ground, but not dust. If you have a few pea-sized chunks in there, don’t sweat it. Using my KitchenAid stand mixer with the whisk attachment, I combined the rest of the sugar with the eggs and beat on medium-high speed for 5 minutes. Turning the mixer off just long enough to add the pecan/coconut mixture, I then turned it back to medium-high and beat for one additional minute. 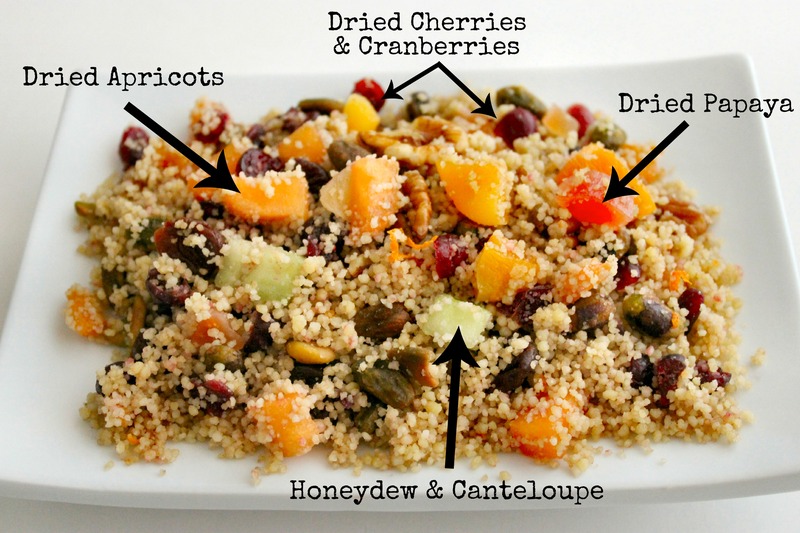 At this point, you’ll want to stop the mixer and scrape down the sides of the bowl. Turning the mixer back to medium-high, I added the softened butter (you’ll want it to be super soft) one tablespoon at a time. (Note: Dorie’s recipe says to use 5 tablespoons of butter, but I softened an entire stick and lost track, stopping at 6 tablespoons. The extra tablespoon of butter didn’t seem to hurt at all, but next time I will use 5, as directed.) Once the butter is incorporated, turn the mixer to low speed and add the coconut rum, beating just until blended. The batter will look a little curdled, just as Dorie described, so don’t panic. There’s no flour in this recipe to smooth things out, so just relax and go with it. Why? Because Dorie says so. I used a gravy ladle to spoon equal portions of batter into each of the 12 muffin cups. Each cup should end up about half-full. Here’s where my secret ingredient came into play. It was this little can of dark chocolate-coated cocoa nibs from my friend Kirsten of Comfortably Domestic. She sent them in a box of goodies earlier this week. I’d never had them before, and my eyes just about bugged out of my head when I tried them. 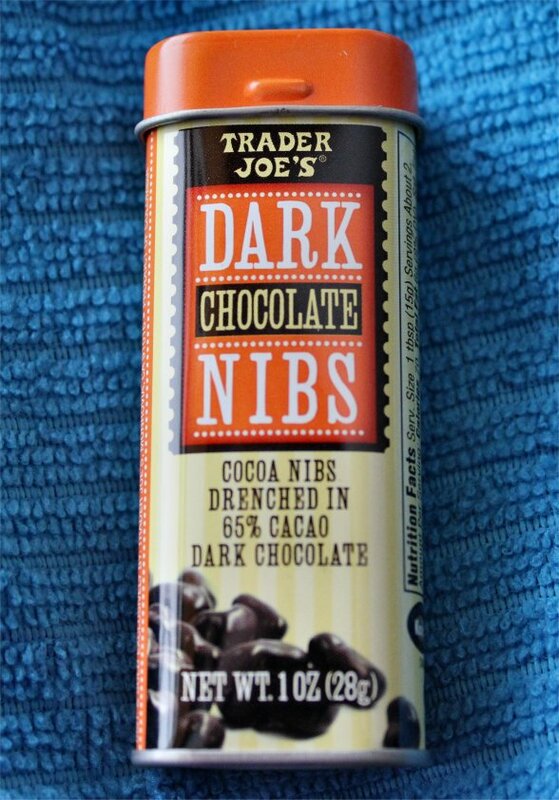 The nibs are crunchy, the chocolate coating is creamy, and together they are simply dreamy. SO when my baby cakes were ready to go into the oven, I sprinkled 10-12 of them on top of my cakes. I left 3 plain, just to try them without the cocoa nibs. BIG mistake. Lesson learned: next time, go all in. Dark chocolate-coated Cocoa Nibs on top? Yes, please! Gently tap the muffin pan to release the cakes. 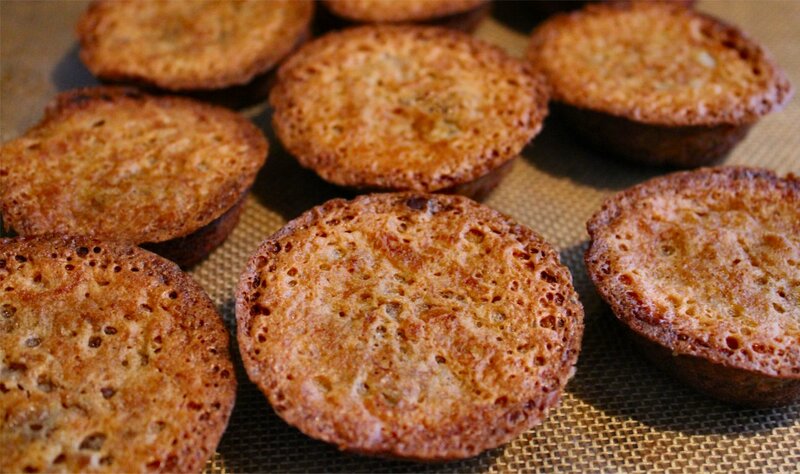 Once the cakes are out of the muffin tin, give them a few minutes to cool, then remove any parchment paper that may still be stuck to the bottoms, and use a flat spatula to flip them back to their full upright positions. 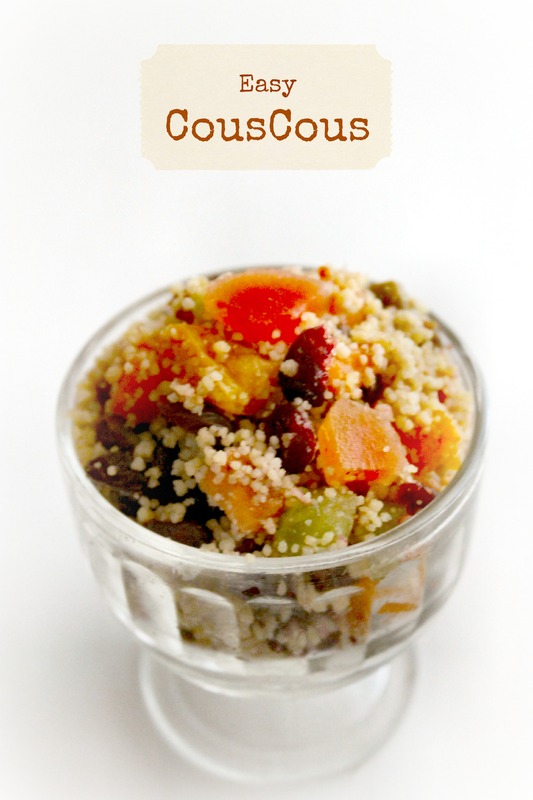 These are best served warm or at room temperature. 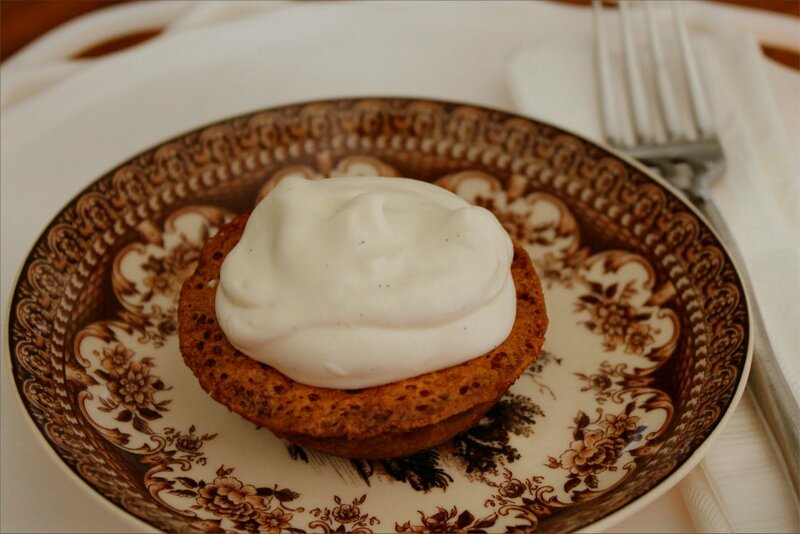 Even better, serve them with homemade whipped cream spiked with a little vanilla bean paste. That stuff makes everything better, but it is BFFs with whipping cream. Plop a big spoon full on the top and go to town. If you’re like me, don’t even bother with a plate and fork. Just blob on some whipped cream and eat it with your fingers. The toasted pecans and coconut paired with all that butter and coconut rum makes these dreamy. But the addition of the chocolate-covered cocoa nibs pushed this recipe right over the cliff. I swear I don’t know how these could get any better. Dorie, you said to let you know if we messed with the recipe, so here’s my contribution. If you try these, I hope you’ll return the favor and let me know. Until then, I can’t thank you enough. These may be Baby Cakes, but they are absolutely HUGE in flavor. And I am totally in love with these little cuties. 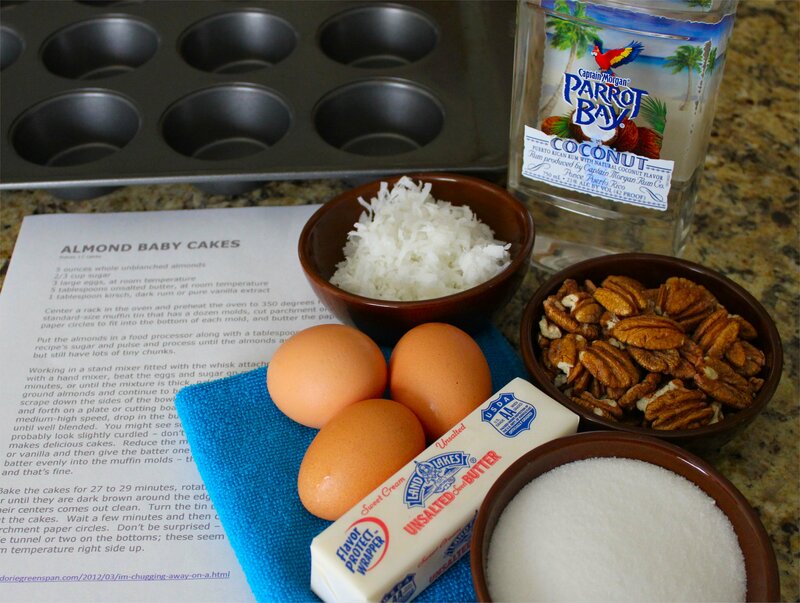 Tagged as Almond Baby Cakes, Baby Cakes, baked desserts, baking, coconut, Coconut Pecan Baby Cakes, desserts, Dorie Greenspan, individual serving size desserts, muffin tins, Parrot Bay Coconut Rum, party desserts, pecans, recipes, why is the rum gone? Read it & weep, ladies. My man bakes chocolate chip cookies. That’s right, ladies. The Complete Package bakes cookies. 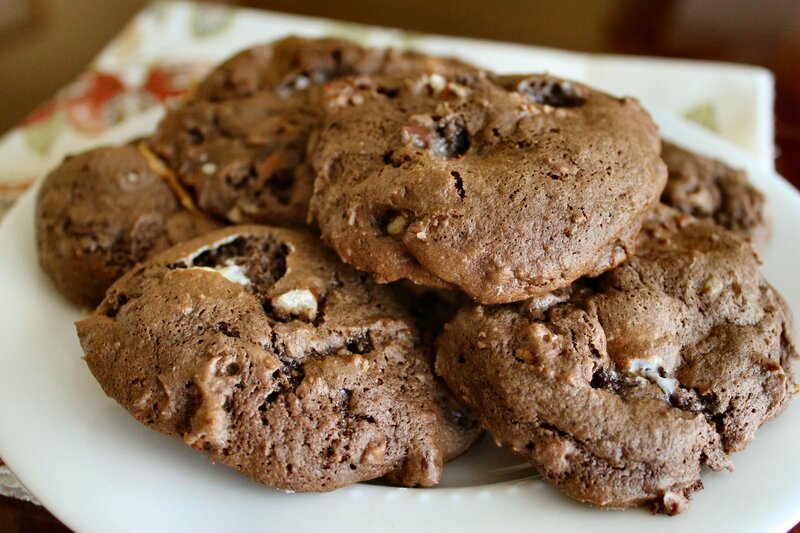 Homemade chocolate chip cookies with pecans. They’re big, they’re warm and they’re wonderful. (That’s what she said!) Here’s how he does it. This makes me question why I separate things into cute little bowls. To begin, set your butter out on the counter to soften. Once you can squeeze it and it gives a little, it’s ready to go. In a large mixing bowl, combine the flour, baking soda, salt and sugars. Whisk to combine. Add the softened butter, eggs and vanilla and mix just until combined. 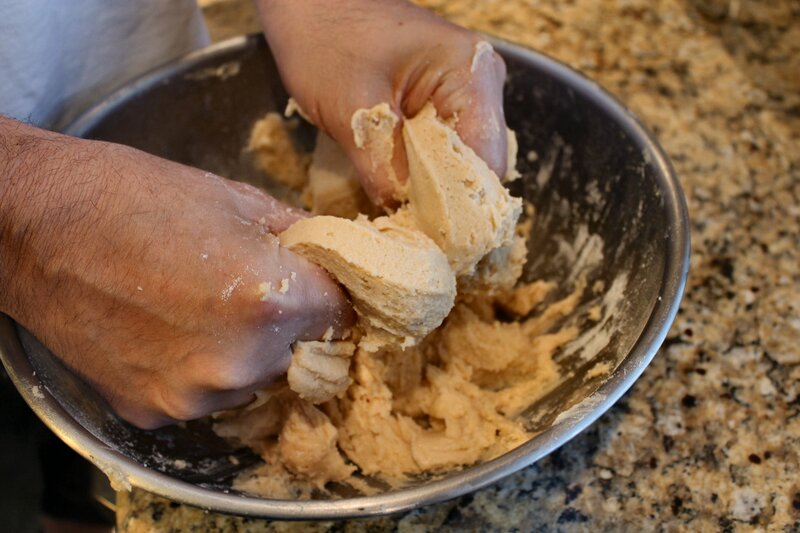 (Note: TCP likes to mix the cookie dough with his hands so that he doesn’t over mix the cookie batter.) Stir in the chocolate chips and pecans just until they are evenly distributed. Do what you want, but I'm not giving up my KitchenAid. 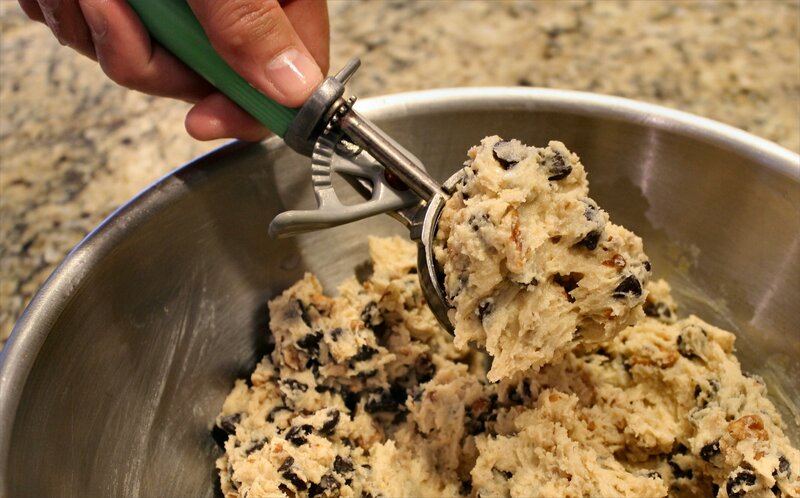 Using an ice cream scoop, TCP creates large balls of cookie dough that are slightly smaller than a baseball. He puts the dough balls into a mixing bowl and places the bowl in the freezer for 20 minutes. 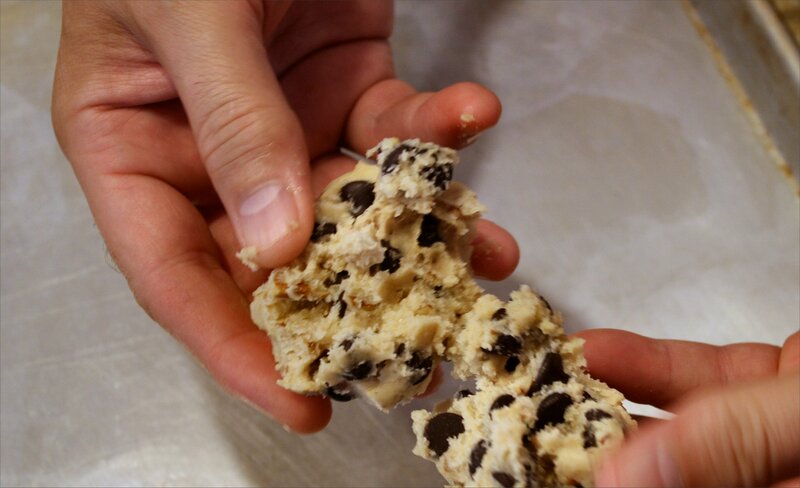 Depending on how warm your kitchen is, it may take a little longer for your cookie dough to firm up. While the dough is chilling, pre-heat your oven to 375F. Once the dough balls feel firm to the touch but not frozen solid, they’re ready. For baking, The Complete Package insists that a thick heavy-duty baking sheet is the key to great cookies. It prevents the cookies from burning on the bottom. One they’re ready to bake, TCP takes the dough balls out of the freezer one at a time, twists them in half, and places the “torn” side up in order to get better lift. Grab one big dough ball at a time & twist it in half. Place them torn side up for better lift while baking. He bakes them six cookies at a time to give them some room to spread out. You’ll want to keep the dough balls in the refrigerator while each pan is baking so they don’t get soft. 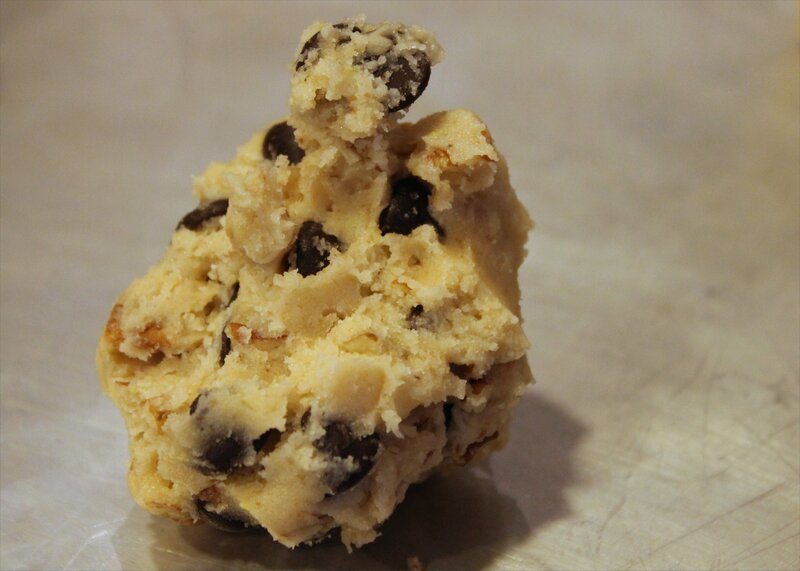 Here is TCP’s theory – soft cookie dough spreads out when baked and makes for thin cookies. 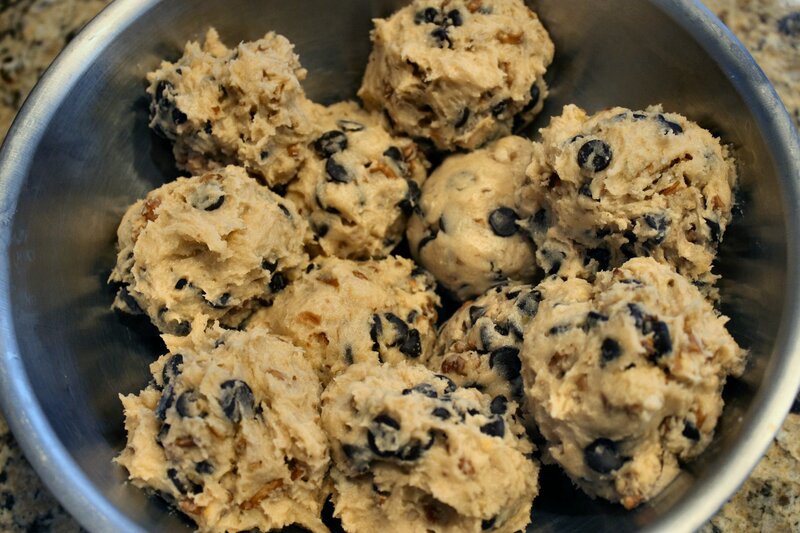 Cold cookie dough that’s piled high will form taller, fluffier cookies. He must know what he’s talking about, because his cookies turn out consistently fabulous every single time. Bake each tray for 15 minutes on the middle rack of your oven until they start to turn a light golden brown around the edges. Keep in mind that everyone’s oven is different. You may want to start watching yours at 12 minutes in case your oven runs hotter, or bake them longer if you have the opposite problem. Once they’re done, remove them from the oven, allow them to cool for a few minutes on the pan, then move them to cooling racks. 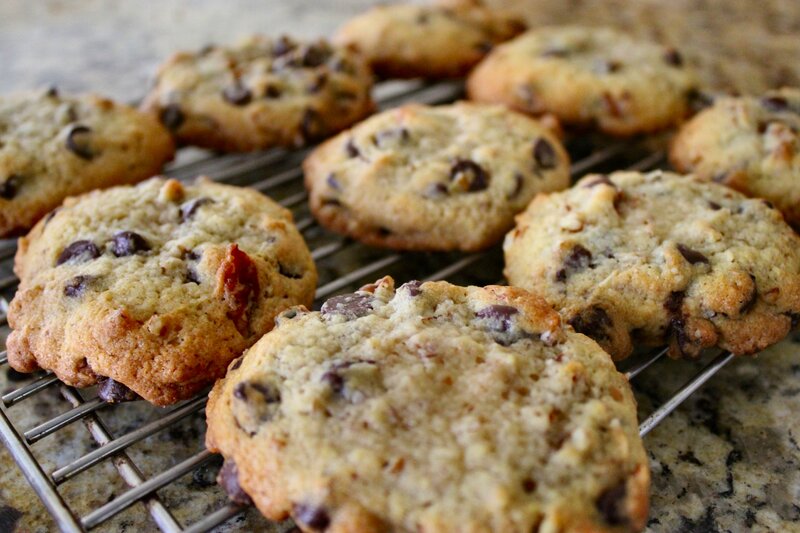 Your house is going to smell SO good when these are baking! Once they’re cooled, grab a gallon of cold milk and get ready for a stampede. 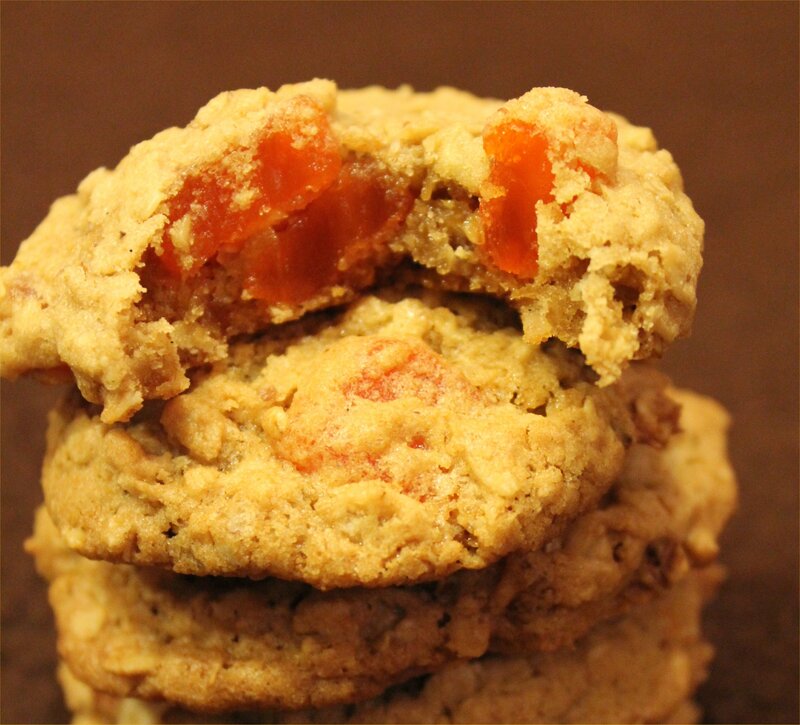 This recipe makes approximately 2 dozen cookies, and they won’t last long. 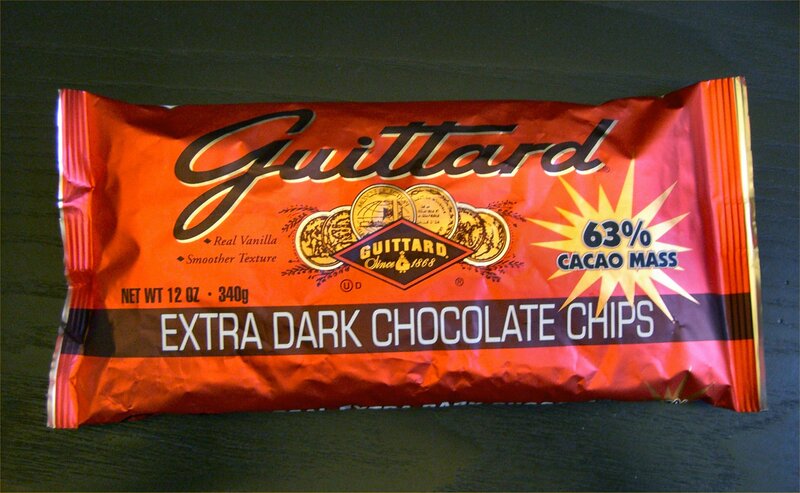 One last tip: if you can find them, try the Guittard Extra-Dark chocolate chips. They are our favorites, and they are worth seeking out. They will rock your world. Guaranteed. Or my name isn’t NanaBread. Well, actually my name is Jeanne, but let’s not get tangled up in technicalities here. Just try them! Cake mixes are on sale at my grocery store. That’s a bad thing. Bad, bad, bad. Did I mention they were only 50 cents a box? Yeah. It’s not just bad, it’s dangerous. I bought six. Okay, I bought eight, but that does NOT make me a cake mix hoarder. Funny thing is, I’m not really a cake eater. In an effort to rationalize the irrational, I was thinking the kids love cupcakes, and I could bake them when they come to visit or vice versa. But then I started doing the math. Each box makes at least 20 cupcakes. I have 8 boxes. There’s a good chance that 160 cupcakes might just be too much for two small children. Way too much. So now I have eight cake mixes that I got for the low, low price of 50 cents a box and I have to think of something to do with them. That’s when a light went off and I remembered seeing recipes for cake mix cookies on the internet. “I like a cookie!” (Name that movie…if you have young children and enjoy animated films.) 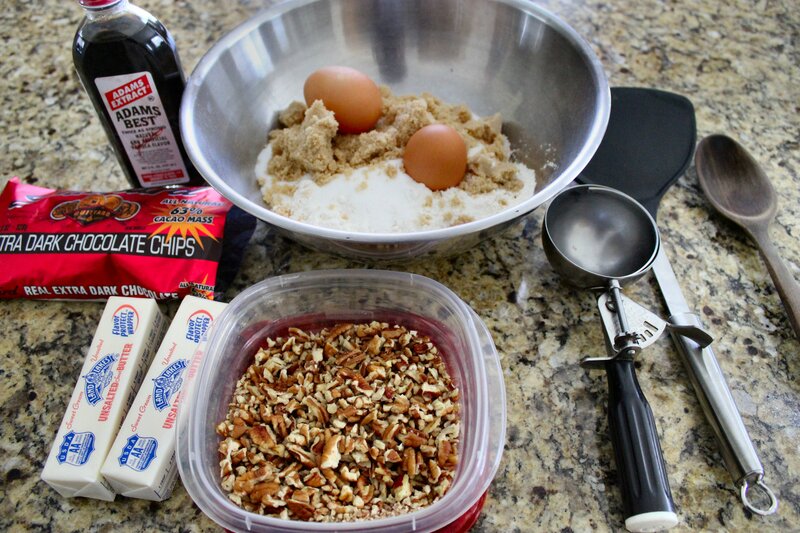 With a little quick research, I found that you can covert a cake mix into cookies with a few simple ingredients. And that’s exactly what I done did. Pre-heat your oven to 350F. 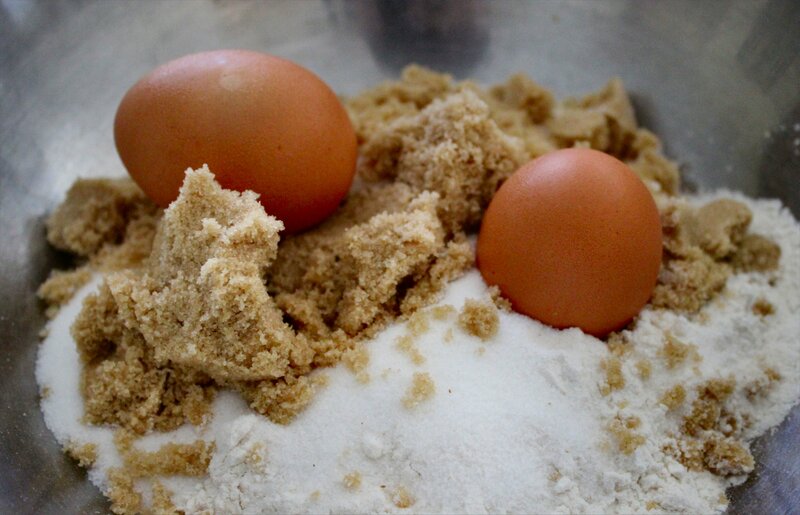 In a mixing bowl, combine the cake mix, eggs, melted butter and vanilla extract. This will start out very dry and take several minutes of hand mixing to get it to come together. I recommend using a heavy-duty wooden spoon, because this dough will be very thick. 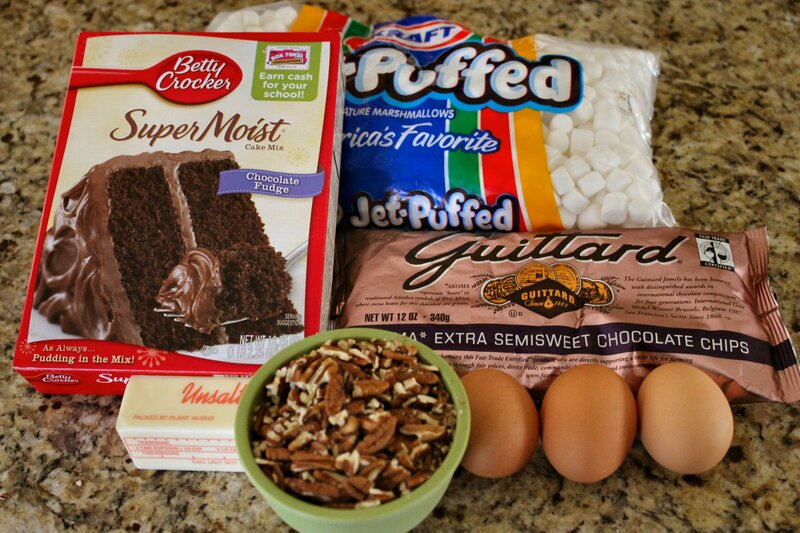 Once you’ve got it mixed together, stir in the chocolate chips, marshmallows and pecans. Using a cookie scoop or your hands, place golf-ball size dough balls onto cookie sheets lined with silicone baking mats or lightly sprayed with cooking spray. Bake at 350F for 14-15 minutes. Remove from the oven and cool on the cookie sheets for at least 20 minutes. Why? 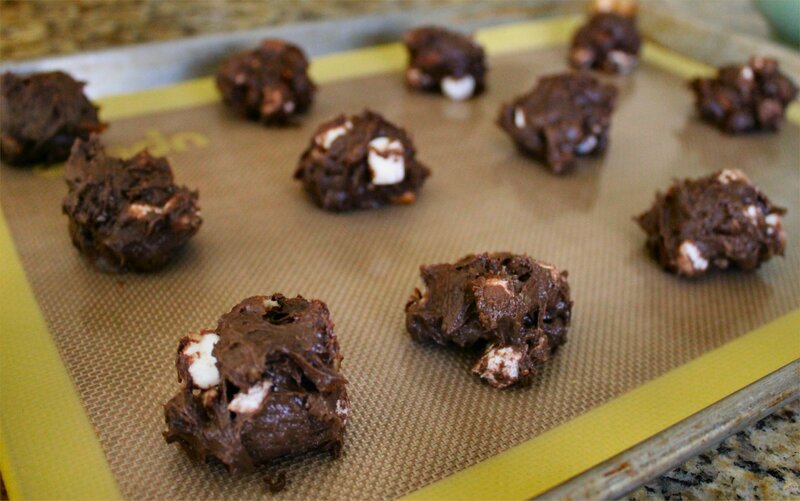 Because those marshmallows are going to be melted, gooey little napalm bombs and cooling them completely on the cookie sheets will allow you to remove them more easily. Would you like one? I’m happy to share. I’ve got a lot more cake mix where this one came from. 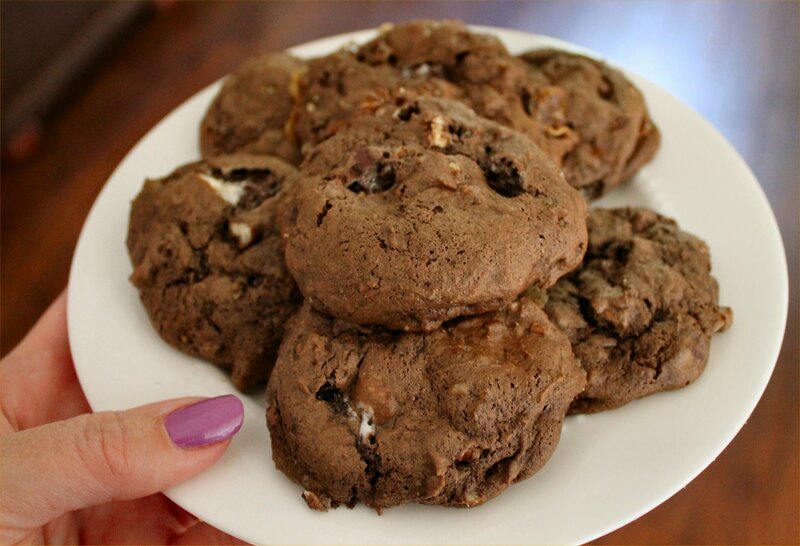 This recipe makes approximately 30 cookies. One last suggestion – make sure you have milk in the fridge before you mix these puppies up. Or a cup of coffee. Or a Slim-Fast. RECIPE UPDATE: A reader on the Pioneer Woman’s Tasty Kitchen site tried this recipe and said hers came out too dry on the outside. I’m guessing her oven may get hotter than mine, since my batch came out soft and chewy. If your oven runs hot, you may want to reduce your baking time to 11-12 minutes instead of the 14 recommended. These don’t brown, so it’s hard to tell if they’re done by looking. The other option is to touch test them. If they’re relatively firm and dry on the outside, take them out of the oven. If they’re still sticky to the touch or too soft, leave them in a little longer. I appreciate your feedback!